Trees have been revered as sacred monuments since the prehistoric era. Our ancestors may well have been inspired by their annual cycle of decay in the autumn followed by a luscious rebirth in the spring. To the primitive mind, these trees became symbols of life, death, and rebirth. There was one tree in particular which achieved mythical status throughout all world cultures. It is known today as the ‘World Tree’ and according to our ancestors, it was truly epic in scale. Its branches were said to reach as high as the heavens, while its roots plunged deep into the abyss of the underworld. Because of their association with celestial realms, these trees were regarded by many priests as gateways to other dimensions. • Yggdrasil was said to connect middle earth (Midgard) to eight other realms (some made of fire and ice, others of darkness and light). 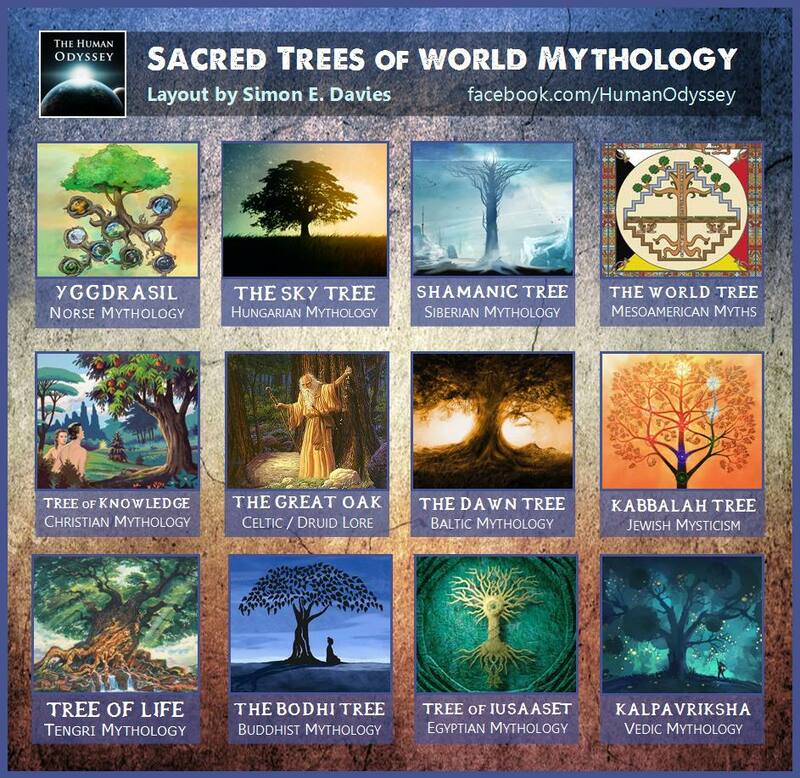 • The World Tree of Mesoamerica was seen as a gateway (aka axis Mundi) connecting the planes of the Underworld and the sky with the terrestrial world. • The ‘Sky Tree’ from Hungarian mythology had a series of branches which reached out to seven worlds. Each branch was said to touch the sun, the moon, the clouds and other celestial spheres. • The Dawn Tree from Baltic mythology was depicted with a golden trunk, copper roots and silver leaves. The trunk represented life in the present, while the past was embodied in its roots (life that has passed). The branches, however, represented future choices yet to be made. It should be noted that in nearly all depictions of the ‘World Tree’, a great serpent is said to reside at its base. • It was Adam and Eve who attained wisdom by eating fruit from the tree of Knowledge (Judaism/Christianity). • It was under the Bodhi tree that the Buddha was said to have gained enlightenment (Buddhist mythology). • The Kabbalah represents the tree of life (the other legendary tree of Christian mythology). Legend says that to learn the secrets of this mystic tree is to know the secrets of life itself. • The Druids were priests of the natural world whose name was said to mean ‘knower’s of the oak’ (Celtic mythology). • In Tengrinism, it is said that humans were descended from Trees, as well as other spirit entities and lesser gods who lived for hundreds of years. • A tree of life belonged to the Goddess Iusaaset who was said to have conceived the lineage of Egyptian Gods through the trees life-giving properties. abundance of life-giving fruit for those who wished for it.